A very BIG announcement from us this month with the introduction of the most iconic of brands: Missoni! We are thrilled to announce that Go Modern is now partnering with this very special, much loved Italian design house to sell MISSONI HOME FURNITURE. We’ve been fans forever… so there’s much excitement in our bit of the Kings Road! Missoni, as you are probably aware, was established in the 1950s as a small knitware business and grew to be the internationally recognized fashion brand. Its colourful zigzag motifs, stripes, waves and patchworks of geometrics and florals are instantly recognisable. The Missoni Home line followed some years later, when the company’s beautiful fabrics were successfully transferred to a large collection of small home accessories. 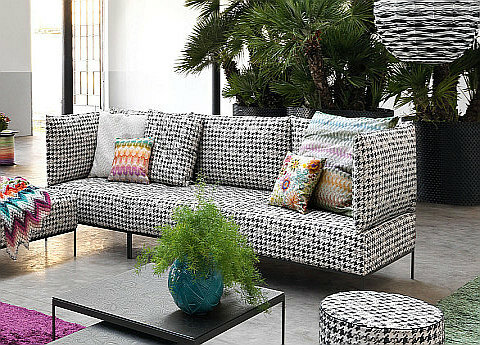 Taking things one step further, Go Modern is the first and only UK retailer to sell Missoni’s contemporary furniture collection which includes sofas, beds, armchairs, screens and a wide range of beautiful outdoor furniture. 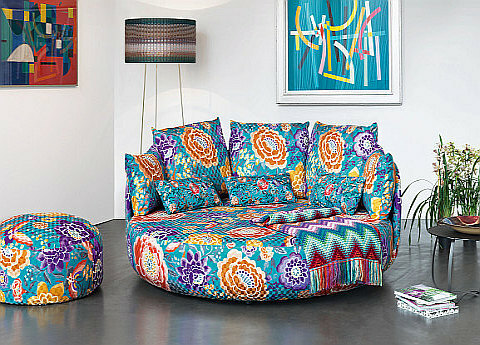 Check out the full collection of our MISSONI HOME FURNITURE here. So, less chat…. let’s show you a few pieces…. New for 2016 is the MISSONI HOME ADAR SOFA – a beautifully slim-line sofa seen here in Missoni fabric Realeza, a striking monochrome geometric weave. The Adar is a modular design and includes armless, central seating units along with left/right hand seats. The covers are removeable and, of course, there’s an incredible selection of Missoni fabrics to choose from. 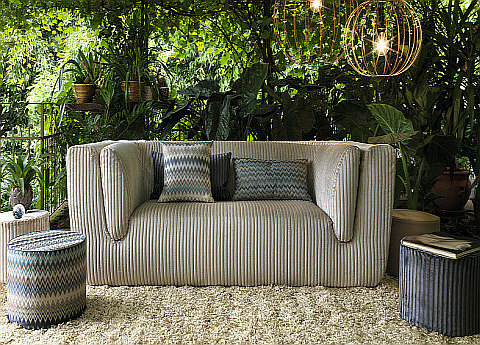 The MISSONI HOME TIAMAT SOFA is a wonderfully roomy, semi-circular sofa offering the perfect lounging design. 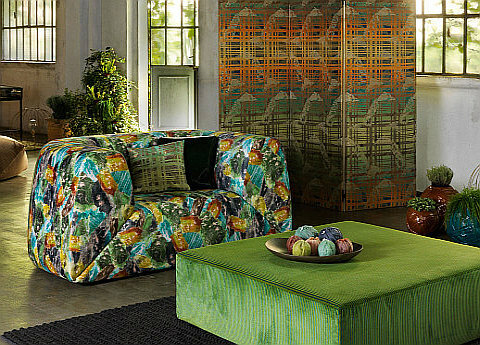 It’s pictured here in the vibrant Samoa fabric, taken from Missoni’s brand new Oriental Garden fabric collection. 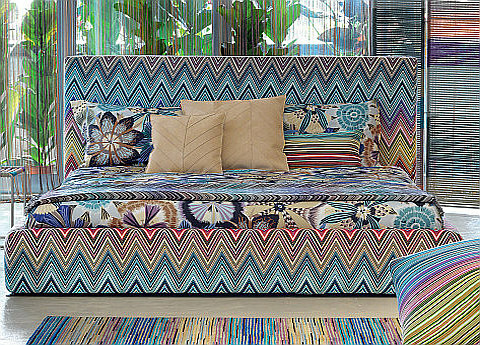 And pop into our Kings Road showroom to see the fabulous MISSONI INNTIL SOFA by Bendik Torvin. We think this sofa has a very ‘Missoni look’ about it, with its dynamic, unbroken flowing design. Come on in and experience your own ‘comfort zone’ (although do check our opening times… we try very hard not to lock our lovely comfortable, sleep induced customers in!) The image below is of the Inntil in Missoni fabric Coomba, which is a pale silver/grey glossy cord. Also by Torvin for Missoni is the GRAVITA RANGE (so called, according to Torvin, as sitting on this furniture creates a feeling of “being pulled towards the earth’s surface” – well, we’re all for a bit of that!). Then there are the beds. Gorgeous Missoni beds. We love the MISSONI HOME SCREEN HIGH BED with its extra high headboard. It’s designed by the Missoni Home Studio team and, if you’re wanting a real bedroom statement piece, choose the iconic Nador fabric that you see here, with the famous multi-coloured zigzag motif. Or, if you’re looking for less bedroom excitement, choose from their plain weaves, stripes, florals or luxurious mohair velvet (or, of course, supply your own favourite). The ADAR BED simply says ‘sleep’ to us, with its comfy deep base and slim, partitioned headboard. The mohair velvet fabric, mentioned above, has been used in this shot of the Adar – it’s the ultimate in luxury and this wonderful, relaxing teal velvet works so well don’t you think? So do hop over from here and check out the full collection and indulge in a little Missoni history in the making. Previous PostPrevious Turning The Indoors Out.. and Go Modern turns 10!